In the figure above, AE, BS, CG, DS, and FS intersect at point S. Which of the following pairs of angles must be congruent? What to do, what to do? It’s often possible to guesstimate on a question like this: they’re asking you which angles are congruent, and the diagram is drawn to scale, so look at the damn thing. Enough choices look plausible here that we can’t take that shortcut, although we can use it to eliminate choice (C) if we like. Which angles are vertical angles? We know that all these segments meet at point S, but which ones actually go through it? AE and CG both go all the way through, so they’ll create a set of vertical angles: ∠ASG and ∠CSE. We know vertical angles are always congruent, so (B) is the answer. You’re really going to want to make sure you’re solid on this kind of question. OK, that was fun, right? Now let’s talk triangles. 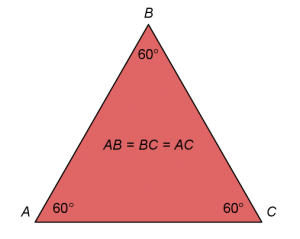 There are only a few things you need to know about angles and triangles for the SAT, many of which are given to you at the beginning of each math section. This post is going to be long (I know what you’re thinking: it’s already long) because there are a lot of different kinds of questions you might be asked and I want you to see them, but don’t be daunted by its length; I’m willing to bet you already know pretty much everything you need to know. Now, as always, you just need to study the scouting report: know what the SAT will throw at you, and you’ll have a better chance of knocking it out of the park. Note also that there is a separate post for the special case of Right Triangles, just to keep the length of this post somewhat manageable. Lastly, please forgive me if my drawings look janky. 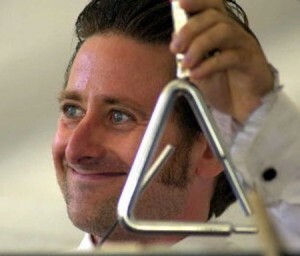 This is called the Triangle Inequality Theorem and there’s a cool demonstration of it here. The basic thrust is this: if one side were longer than the other two, then how would those two shorter ones connect to form the triangle? They couldn’t. And if one side was equal to the sum of the other two, would you have a triangle? No, you’d just have a straight line. To drive this home: imagine your forearms (apologies to my armless friends) are two sides of a triangle, and the imaginary line that connects your elbows is the third side. If you touch your fingertips together and pull your elbows apart, eventually your fingertips have to disconnect…that’s when the length between your elbows is longer than the sum of the lengths of your forearms. Neat, huh? 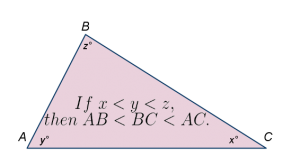 There’s an awful lot to know about non-right triangles if you’re doing math, but on the SAT, the preceding basically covers it. You will never need trigonometry of any kind, nor will you need any knowledge about things like circumcenters or orthocenters of triangles (Google them if you’re curious). Occasionally it’ll be nice to know triangle congruence/similarity rules, but I’m not going to recreate them here because honestly, it’s incredibly rare that you’ll actually need one. There are some who think you need to know things like the external angle rule, or rules about alternate interior angles and opposite exterior angles in transversals. I say: if you know a straight line is 180° and you know a triangle’s angles add up to 180°, you already know them! Don’t overcomplicate your life with overlapping rules. I’m in the business of preparing you for a very specific test. The above is, in my expert opinion, the salient stuff. Isn’t it awesome how little of it there is? If y = 180 – x and all lengths are integers, which of the following could be the perimeter of the triangle in the figure above? Wait, what? We don’t know anything about any of the lengths, how are we supposed to figure out anything about the perimeter? Relax, friend. We’ll get through this. WTF. It doesn’t look like it, but we’ve got an equilateral triangle on our hands: all the angles inside it are equal so they must all be 60°! If all our lengths are integers, then, the perimeter must be a multiple of 3. Only one of our choices is: (D) 24. Is it over yet? Nope. Drills. what is the solution to the last question?? if 2 sides are 9 then third side is between 0 and 18 so max perimeter is 9+9+17 = 35 so thats why (E) is not possible! How is the answer A??? It doesn’t say anywhere that the equal sides are 9. 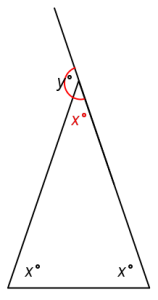 (E) is possible if the sides are 30, 30, 9. 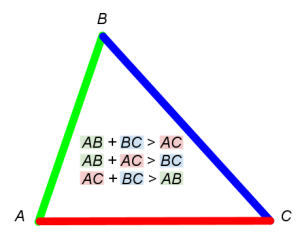 (A) is not possible because the other sides would have to be 3 and 3 to make the perimeter 15, but sides of 3, 3, 9 break the triangle inequality rule. another way to solve, though requiring time and carefulness, is to find the range of the perimeter. there 2 possibilities here: [9,a,a], [9,9,a]. apply the inequality theorem, [9,a,a] have P=9+2a > 18, [9,9,a] have 18 < P = 18+a 18. It is the only requirement to satisfy the problem. Then A is the answer. How do you do 14? Extend the lines to create more transversals, so you can fill in more angles. Once you’ve got what looks like an X between the two parallel lines, you should be able to fill in every angle and get the answer. Could you draw a picture of how to do #14? I still can’t seem to figure it out. Hey Mom. You have my phone number. You know you could just call me for things like this, right? Give my love to Dad. Can you also use the vertical angle of 128 added to 59 and subtract the sum from 360 to find the vertical angle of x? By the way, what did you want for dinner? Each straight line adds up to 180º. Note that the marked angles each represent a straight line, but are missing one angle from the inner triangle. So they represent 3 straight lines, minus one triangle. 180(3) – 180 = 360. Alternatively, you could just plug in 60º for each angle. Any time the SAT gives you a triangle question with no angles filled in, they’re testing you on something that must be true for all triangles. So plugging in 60º for each angle is a nice way to start thinking about the problem (and in this case, is enough to get it right). how do you do number 16? On page 153 of your guide (#19), how do you know to choose PQ < PR+PQ as a possible expression to start with instead of QR< PR+PQ, for example? Attempting to solve the second expression yields QR-PQ<PR, which is different from PQ-QR<PR. If the expression, PQ-QR< PR is true, shouldn't choosing multiple combinations of sides in the triangle inequality form to start with produce that same expression after a few algebraic manipulations? PQ< PR+PQ happened to give the same expression, but other combinations do not. I'm thinking that if the expression is true, any combination of sides used should give PQPQ”: I picked for PQ “5” and for PR “4”. 2PR makes 8, which is greater than PQ (5), so I don’t understand why that’s not the choice. You picked an isosceles set up and in that instance, found option #3 to be false. I think the confusion is probably from not understanding what “MUST” means in regards to the math problem and how you get those specific triangle inequality combinations to start with. I think I see what you’re asking, though, so let me try to address it. As you noted, I chose an isosceles (10–10–2) triangle as a counterexample. It didn’t need to be isosceles, though. A 10–9–2 triangle would have worked just as well. It might be more intuitive to just begin with the inequality you’re given, add QR to both sides, and then note that it’s one of the inequalities that must be true by the Triangle Inequality Theorem. WONDERFUL EXPLANATION! The swan example removed any confusion I had about the “must” concept in math. As for option 1, I started with PQ+PR> QR and expected to get PQ-QR< PR with algebraic manipulation, but got PR< QR-PQ, which is different from PR< PQ-QR. Because expressions can be rewritten multiple times to isolate each different variable and still mean the same thing, I thought that any one of the inequalities can be re-written to look exactly like option 1, if the expression was true. This made me think that one of the inequalities was a counterexample to option 1. Ah…In when you start with PQ + PR > QR, you can’t get to PR < QR – PQ. You flipped your inequality sign somehow! You should get to PR > QR – PQ. On Page 297 (#18) of your guide, why does the hypotenuse of the square base become the leg of the triangle? At first, 50 sqrt (2) was the hypotenuse and 50 was its legs, but now the 50s are hypotenuses while 50 sqrt (2) is a leg. #20: What’s the explanation for why the solid must be a cube? I tried putting in a rectangular prism instead and got no where. Is it likely that most 3-D questions which do not show diagrams will use square bases to solve the problem? -Just like in #18, something similar happens when working with the figure in 2D. The hypotenuse s sqrt (2) becomes the leg of the triangle while 8 remains the hypotenuse. Why didn’t “8” become the leg and “s sqrt (2)” stay as the hypotenuse? I’m not understanding why those numbers changed placements on the triangle the way they did. P.S: Sorry for posting my question on the wrong section of your website. For some reason, I can’t post new messages directly from your website and instead have to REPLY to your previous ones. #18: HALF the hypotenuse of the square base becomes the leg. So you have a triangle where you know the hyptenuse (50), one leg ((50√2)/2 = 25√2), and need to find the other leg, the height. As to why the s√2 changes from hypotenuse to leg, it’s because you’re using a different triangle now. s√2 is the hypotenuse of the square base, but that hypotenuse becomes one leg of the right triangle with 8 (the cube’s diagonal) as its hypotenuse. 18: So, the diagonal, or the hypotenuse, of the square base initially becomes the base of the new triangle (the one you took out of the square base) then becomes a leg when you draw a perpendicular line down the figure to make it a right right triangle? I think that’s why the 50 becomes the hypotenuse. That helps. 20: I didn’t think a cube was considered a rectangle because rectangles don’t have equal sides. Also, I’m not sure what you mean by ” play around with the angle between the two diagonals, you’ll see that the biggest shape will be when the diagonals are perpendicular, and you’ve got yourself a square.” I wish I knew what you meant by that, but it’s difficult to understand that concept without a picture. You can draw the same kind of diagonals for both a 3D square and a 3D rectangle, but it’s not clear to me how one fills up more space in the sphere than the other. When I tried to solve the problem, I drew the sphere with the inscribed 3D rectangle; however, it seems that you only need to draw a diagonal across the figure instead of going through the trouble to draw a sphere. When I drew the sphere, my diameter was drawn horizontally instead of diagonally, which completely confused me. Glad I helped on #18. Let me try again on #20. Rectangles CAN have equal sides–when they do, they’re called squares. Side note: I love this diagram for remembering all the different kinds of quadrilaterals, even though you’re not going to need to know anything about kites for the SAT. I think I agree with what you’re saying in your last paragraph. You find the diagonal of the square on the bottom, then you use that diagonal as a leg of the triangle that’s standing up straight. If that’s what you’re seeing in my work, then you’re correct. The diagram and the explanation is very helpful. I appreciate it. Thanks for the kind words. I am happy to help. I got #18 (page 200) wrong after I tried back solving. What is the proper way to back solve for this question? Is it a coincidence that this method got me the starting average (87) or is there a more proper mathematical way to get the solution besides the table? It might help to see what happens when you try a different choice. 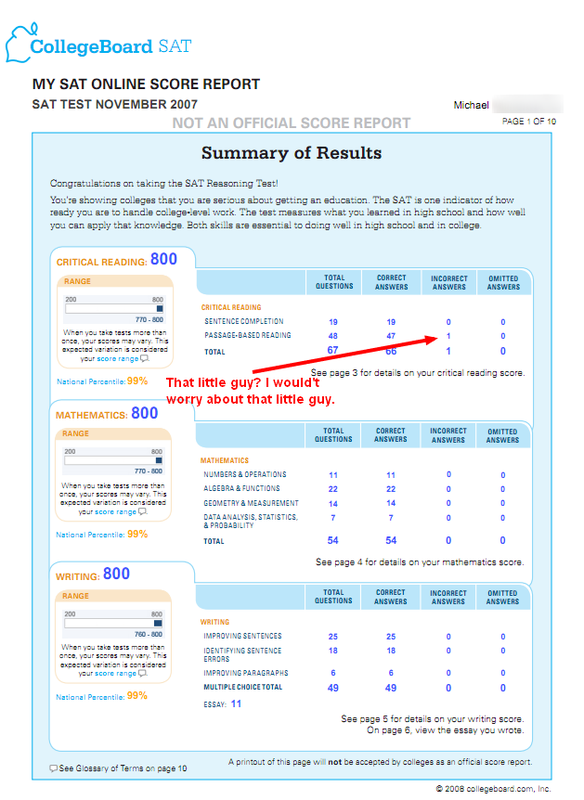 You should get a number other than 87, which would tell you that your choice was wrong. Starting with (C), assume there were 6 days with an average of 87º (meaning the sum of the high temps of the first 6 days is 6×87). Then your 7th day has an high temperature of 93º. Does that bring the monthly average up to 89º? (6 × 87 + 93)/7=87.85. That hot day didn’t bring the average up enough, so there must have been fewer than 6 days. Try a smaller choice, etc. I see that 3 of the ” * ” make a line, so each ” * ” is 60 degrees. However I only counted 11, and I counted multiple times. 11(60) is only 660. Where is the twelfth ” * ” ? Gotcha. Those two form a supplementary angle. I guess the *s were just markings and not variables. Thanks! Right…just markings. Instead of focusing on how many *s you see, focus on how many 180ºs they create. Sorry, I feel like I ask so many questions haha! Why is 17 (a)? is it because if two sides are 9, it adds up to 18, plus you have one more side.. so it can’t be 15 since its lower than 18? If the equal sides are 9s, then you’re already over 15 without the third side. If 9 is the unequal side, then the other two sides need to be 3 and 3, but that won’t make a triangle because 9 is bigger than the sum of 3 and 3. That’s what the triangle inequality theorem mentioned above teaches us. Can you please help me solve #6 on drill 2, thank you! Each triangle has total angles of 180, and there are 6 triangles. 180 × 6 = 1080. Then you just have to subtract the angles of the triangles that form the middle of the figure, since those aren’t labeled. Those add up to 360. 1080 – 360 = 720. So the 12 angles have a sum of 720. Divide that by 12 to get the average: 720/12 = 60. Please, can you explain how to deal with #6 from the Diagnostic Drills #2? Each triangle has a total of 180º, and there are six of them, so that’s a total of 1080º. However, we don’t care about the angles that form the center of the hexagon, since they’re not marked. You know those angles add up to 360º, because they go all the way around, so you know the marked angles must be 1080º – 360º = 720º. 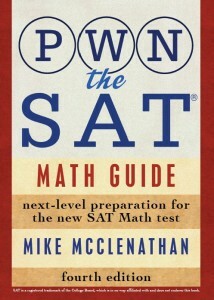 720/12 = 60. Oh, it is so clear now! :) Thank you for fast reply! Try to ignore all the shapes in the middle and just focus on the straight lines that make up the outside of the figure. Each of those must sum to 180 degrees.